Or an active-active fail-over cluster à la VMware. 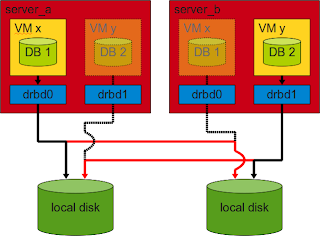 Today I have learned about a totally crazy/cool looking architecture where the expensive VMware ESX server was replace by a free/cheap VMware Workstation version in combination with DRBD. According to this customer it works stable on about a dozed of installations and they have not experienced any troubles during the fail-overs. PS: When you consider such an architecture do not expect a very good performance! You should expect stellar performance, actually! DRBD, when configured well, has less than a 10% overhead. When scaling to > 2 nodes, it's probably recommended to use iSCSI. A pair of redundant iSCSI serveres (replicating with DRBD, of course) can serve 10+ VMware hosts if they have a few bonded gigabit NICs. I have set up almost identical scenarios on top of Xen, and I found performance to be quite acceptable. I've also implemented the same thing with Oracle 10g XE (which was a little adventure trying to "staple on" HA to a product that does not support it in any way, and is as horribly installed as Oracle), and with Microsoft SQL Server running within Windows 2008 servers which were also VMs on Xen with DRBD as the backing storage. Windows is a special case though as it is hard to get 2008 working on Xen with good PV drivers. Nonetheless, anything is possible. What is CHECK TABLE doing with InnoDB tables?